Shaun Beeley, in action against Oxford earlier in the season, is a doubt with thigh problem. Morecambe boss Jim Bentley wants to see some of the steel that saw The Shrimps draw at Oxford earlier in the season when Michael Appleton’s high-fliers visit the Globe Arena on Saturday. Bentley’s side have shipped several soft goals in a five-game winless run in League 2. But back at the Kassam Stadium in September, Barry Roche saved a penalty in a battling 0-0 draw and Bentley wants see more of the same from his side this weekend. The Shrimps boss said: “We were very good down there. “We were up against it and they got a penalty but Barry Roche saved it. “It was a good clean sheet and we’ve got to do more of the same because that’s been our Achilles heel this year. “We’ve been involved in the most goals of any team in the country. Only us and Northampton have scored more than 50 goals in the league this season. “That’s a massive positive and shows we’ve got it going right one way but haven’t got it right going the other way. Appleton’s side are currently third in League 2 after a late Jack Thomas goal saw them denied all three points against Mansfield on Tuesday night. Oxford have also reached the Johnstone’s Paint Trophy final in what look’s like being a memorable season at the Kassam. Bentley said: “Oxford are going for it, the pressure’s on them. “They’re a big club who invested well in the summer. “They had a ropey couple of seasons and were a little bit up and down but this season Michael Appleton has been backed and has brought in good players. “They’ve got the likes of Kemar Roofe who I’d regard as one of the best players in the division and have done very well. “They’re in the automatic promotion places and that’s what they’ll be aiming for. They won’t be looking for the play-offs they’ll be looking for the top three. On paper it looks like only one side have something to play for with The Shrimps now 10 points shy of the play-off places. Bentley said: “We can’t do anything about the past, we’ve just got to make sure we keep trying hard, battling away and look to the future and try and win as many games as we possibly can. Full backs Shaun Beeeley and Laurence Wilson are both doubts while Aaron McGowan is closing in on a return from a hamstring problem. Bentley said: “McGowan’s making good progress and we’re hoping he’ll be back in full time training next week, maybe even at the end of this week. “Beeley’s had a little bit of a problem with a thigh and an infection in his toe so he missed last week and we’ll be hoping he’ll be back sooner rather than later. 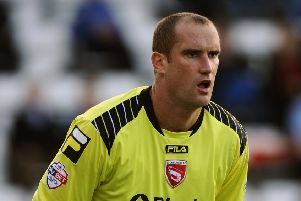 “The same goes for Laurence Wilson who jarred his knee on the astroturf the Friday before the Mansfield game.